How do I know if we have the New Spending Interface or the Old Spending Interface? How do I set up a spending rule? How does the Yale Method spending calculation work? This illustration will show how, for a client that has distributions impacting unit price instead of units, excluding funds from participating in a spending rule can impact the unrealized gain/loss allocation across funds. In the examples below, the removal of two funds from the spending rule will cause decreased unrealized gains to be allocated to the the funds still assigned to the rule. The two removed from the spending rule assignment will received increased unrealized gains. When the spending rule is set to calculate spending based on a DOLLAR AMOUNT PER UNIT and distributions impact unit price, the estimated spending amount is calculated for the pool and then applied proportionally to the funds in the pool based on the number of units owned. The $ AMOUNT PER UNIT ($.50) amount was calculated using the Average Unit Price Method. 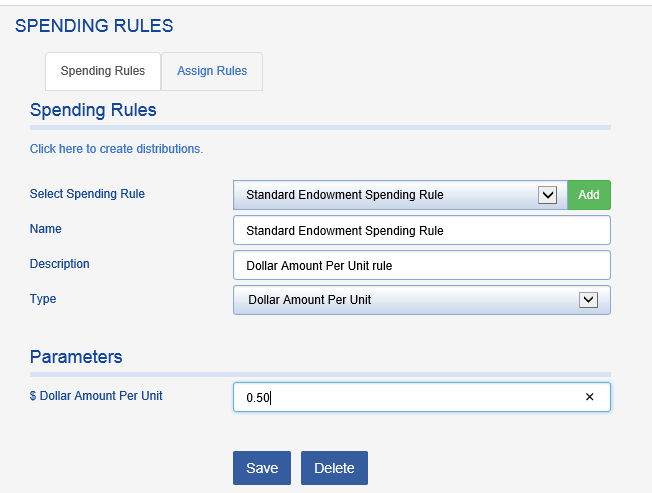 Spending distributions are then created using the automated distribution function in Fundriver (ACTIVITY > DISTRIBUTE). After distributions are made, the period is posted. 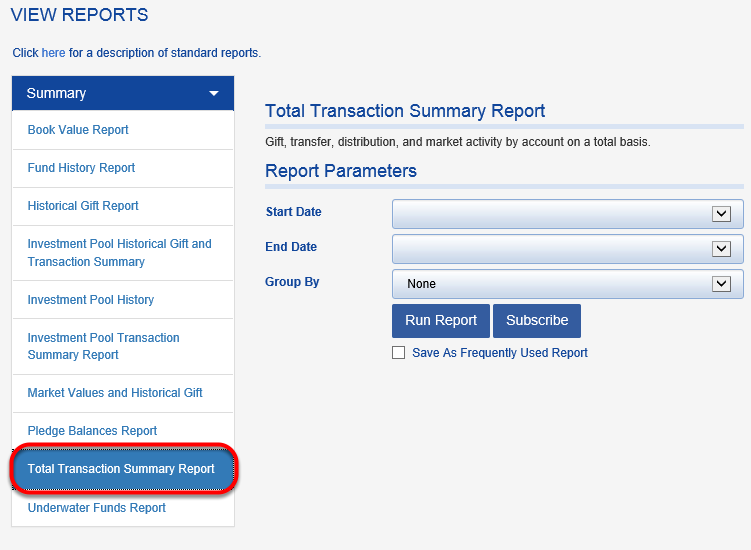 To see how the initial distribution calculation impacts funds we run a TOTAL TRANSACTION SUMMARY REPORT for the period (located in REPORT > SUMMARY). The two funds that we will be removing from the spending rule in the next example are the MARKETING CHAIR and LAW LIBRARY. You can see the DISTRIBUTIONS and UNREALIZED GAINS/LOSSES for those funds circled below. 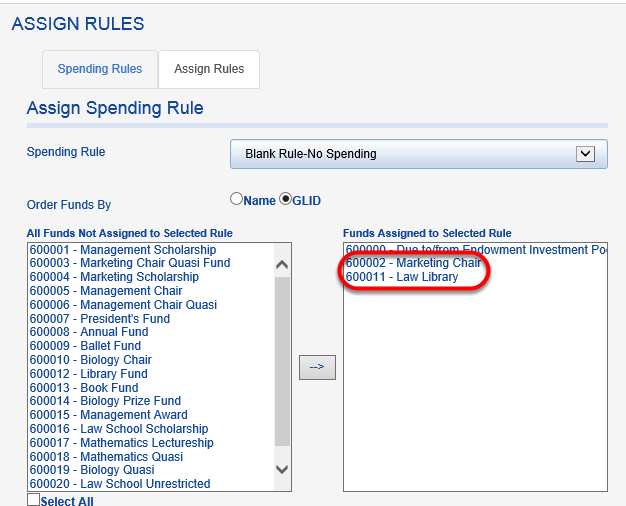 For the second illustration, we will remove the MARKETING CHAIR and LAW LIBRARY funds from the spending rule by assigning them a BLANK RULE-NO SPENDING. For the same period as in the first illustration, we create distributions with the two funds removed from the spending calculation. 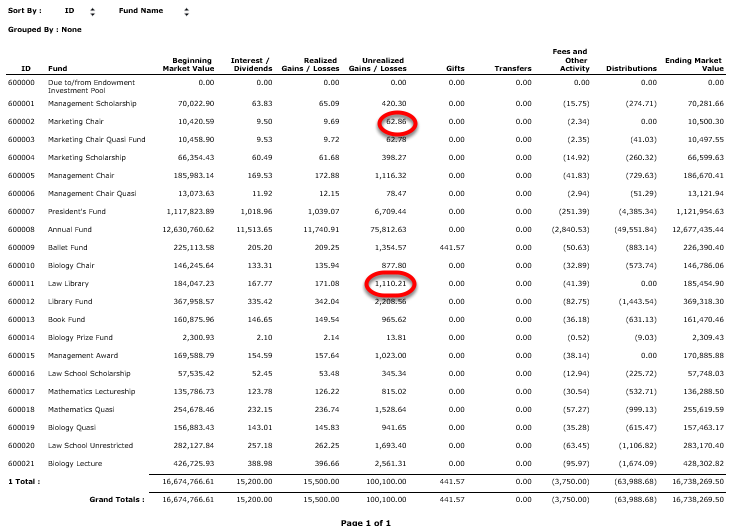 As you can see on the TOTAL TRANSACTION SUMMARY REPORT, the two funds that were assigned to the blank spending rule received different unrealized gains/loss allocations than they would have had they participated in the spending rule. 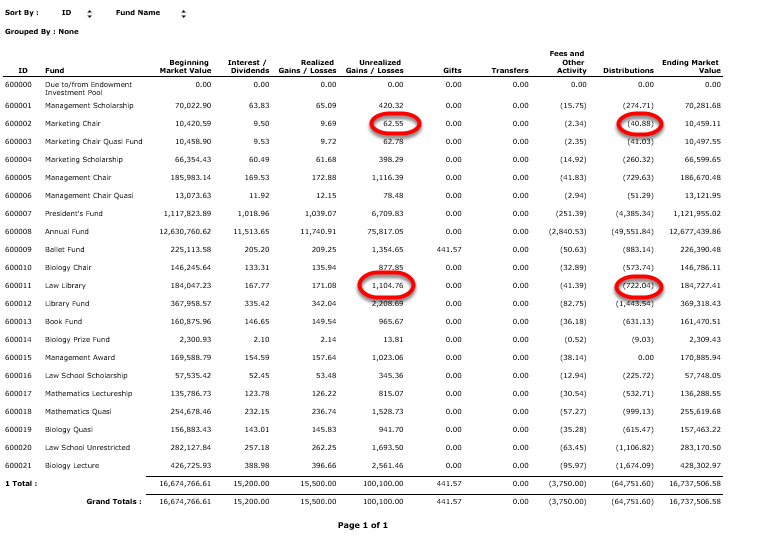 Both funds received additional gains than they would have had they participated in the spending rule, and the other funds in the pool received a smalled allocation than in the first example. This is an example of how choosing to have distributions impact unit price (and then not having all funds in the pool participate in the same spending rule) can impact the rest of the pool.